WARSAW, Poland (AP) — A Catholic archbishop and other speakers at the funeral Saturday of slain Gdansk Mayor Pawel Adamowicz urged an end to the political and social divisions in Poland, targeting some of their comments at the country’s ruling right-wing party. Adamowicz, 53, died Monday after being stabbed the night before at a charity event in the northern Polish city. The arrested suspect is an ex-convict who publicly voiced a grudge against an opposition party, Civic Platform, that Adamowicz once belonged to. 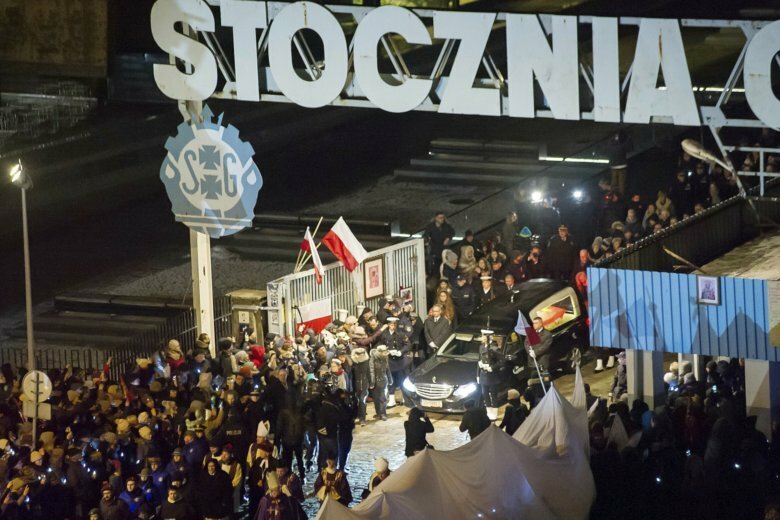 The slaying, which came as Poland faces a deep political divide over actions by the conservative ruling Law and Justice party, was a shock to the nation. It has drawn calls for greater national unity and condemnation of hate speech that has intensified in public amid political rivalries. In his sermon at the funeral, Gdansk Archbishop Slawoj Leszek Glodz said Adamowicz’s death was a ringing alarm bell. “Our homeland needs harmony” in its social life and politics, Glodz said. Other speakers at the church drew applause, unusual for a funeral ceremony in predominantly Catholic Poland, when they denounced hostility in public and political life. “We will not remain indifferent to the spreading poison of hatred in the streets, in the media, in the internet, in schools, in parliament and also in the church,” said Dominican friar Ludwik Wisniewski, a friend of the slain mayor. He appealed to public officials to put an end to such actions. After the mayor’s slaying and TV reports blaming only the opposition for aggressive language, some called this week for the head of the state TVP to be fired. It remained to be seen how appeals for unity will play out in campaigns for the European and national parliaments this year. Pope Francis sent rosaries to the family and assured them of his prayers. Prayers were also said by Jewish and Muslim leaders. Crowds overflowed into the streets of this Baltic port city but were able to watch the funeral Mass on giant screens. Black-and-white photos of the popular mayor were also seen in many shops and apartment windows. This story has been corrected to show that the mayor’s first name is Pawel, not Piotr.